When we were negotiating for the purchase of a piece of land, the realtor told us that the lot we were interested in had no access to public waterworks, which meant we would have to dig a well. At first, this aspect seemed like a demerit, since hiring a company to dig the well would cost more than ¥400,000 plus administrative fees. But we later discovered that buyers of properties in a housing development about a kilometer west of us who did have access to public waterworks had to pay an initial contract fee of ¥200,000 to ¥300,000 just to have their plumbing turned on. And, of course, thereafter they would be receiving bimonthly bills charging them for water usage. We, on the other hand, have not had any more water-related expenses since digging our well, so it turned out to be a good move from an economic standpoint. We belong to a minority. 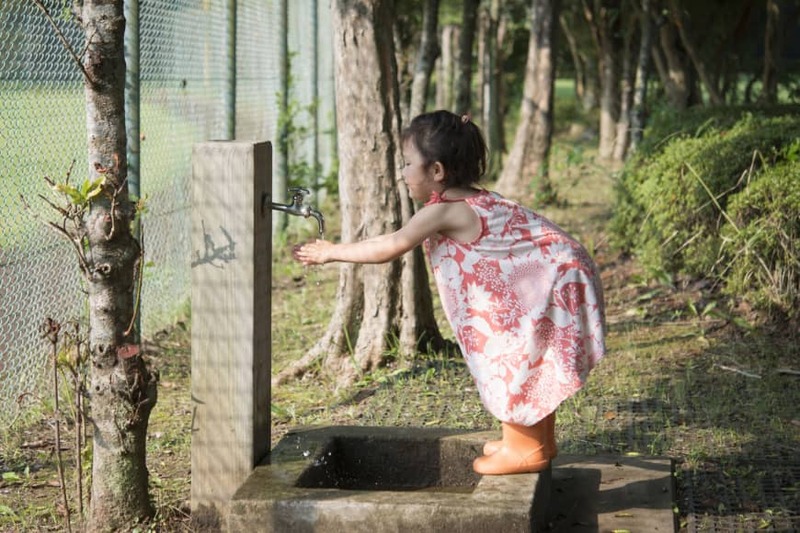 In Chiba Prefecture, where we live, only 4.8 percent of the population lacks access to the public water system, according to the health ministry. With a penetration rate of nearly 98 percent, Japan is a world leader when it comes to waterworks, which is a good thing because from now on there will be less economic incentive to increase penetration due to declining population numbers, successfully promoted water-saving measures and the high cost of waterworks construction and maintenance. After we moved in we called the municipal waterworks operators that service neighborhoods in surrounding areas. All told us there was no plan to extend pipes into our neighborhood, and there never will be. There just weren’t enough potential customers where we lived to make it economically worthwhile. Local governments operate waterworks, and according to a feature in the June 4, 2018, issue of the business magazine Toyo Keizai, many can no longer manage the cost of distribution using only funds derived from user fees. The main problem is maintenance, which is becoming more expensive as systems age. Typically, the lifespan of a pipe is 40 years, and as of 2015, 13.6 percent of the pipes in Japan were older than that. 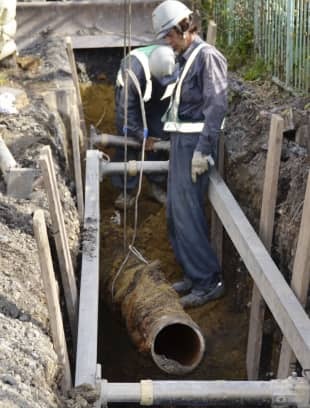 Given that the number of outdated pipes has doubled in the previous 10 years while revenues from user fees had dropped by ¥200 billion, according to the magazine, it is clear that maintenance will become more of a problem for public utilities from now on. Many municipalities, in fact, have to tap their general account budget for funds to fix aging waterworks. But infrastructure maintenance is just one burden placed on public waterworks. There are also legacy costs. Many water systems in the country rely on dams that municipalities are still paying off. In the end, users shoulder this debt. Also, dams ostensibly assure there is a water supply by storing it in reservoirs, a means of provision that requires chemical treatment and filtration, adding to the cost. Dams and reservoirs also need to be maintained. Consequently, some consumers believe dam construction is an unnecessary burden. Residents in Sasebo in Nagasaki Prefecture have sued the central government over their opposition to the construction of a new dam at a time when demand for water is decreasing. These reasons and others are why the central government recently approved an amendment to the Water Supply Act that will allow private contractors to enter the public waterworks field on a concession basis, the idea being that private companies are better equipped to address the changing financial nature of the sector. For instance, according to Toyo Keizai, the loss of water due to pipe leakage is only 5 percent nationwide, lower than it is in most advanced countries, but it costs a lot to keep it that low. It is easier for private concerns to rationalize rate hikes to meet maintenance demands. However, as one water agent told Toyo Keizai, basing a business only on user fees will not cover rising costs in the long run, adding that if the local government takes care of maintenance, it could work out. But as one expert told the magazine, the discussions shouldn’t be about who operates the waterworks but rather what price would be acceptable. According to the Development Bank of Japan, 60 percent of local governments will need to increase rates by an average of 60 percent by fiscal 2046 compared to those in fiscal 2014. Most likely wages are not going to increase at the same rate, so it’s logical to imagine consumers trying to cut back even more on water usage. For reference, the average single-person household in Tokyo in fiscal 2016 paid ¥3,209 a month for 8.2 cubic meters of water, according to statistics attributed to the Tokyo Metropolitan Government on Kirimoru.com, a website on how to save money. Water rates vary greatly from one municipality to another — in fiscal 2016 the town of Naganohara in Gunma Prefecture charged almost 10 times what the city of Ako, Hyogo Prefecture, charged for 10 cubic meters of water. Conservation is an ongoing endeavor, and the biggest use of water in a Japanese household is for bathing — a daily routine for many. However, baths do have an advantage over showers in terms of saving money. Because the individual washes their body outside the tub, a whole family can use the same water on a given evening. Also, bath water can have secondary uses for laundry, watering plants and even washing the car. Though showering uses less water per session, none of that water is saved. One minute of showering uses 12 liters of water, and in Tokyo a 10-minute shower costs about ¥29, according to the website. That’s almost ¥900 a month for a daily shower. Water for drinking and cooking is a more difficult matter to analyze. The increasing global trade in bottled water over the past three decades has prompted backlash for various reasons. The transportation and packaging of potable water has lead to all sorts of environmental problems — an overabundance of plastic, fuel expended to move water from one place to another and private companies monopolizing local watersheds and aquifers. In Japan, which is blessed with an abundance of water sources and rainfall, production of bottled water has increased from 87,000 kiloliters in 1982 to 3.25 million kiloliters in 2017, according to the Mineral Water Association of Japan. At the same time, imports of bottled water have gone from 163 kiloliters in 1982 to 339,517 kiloliters in 2017. Environmentalists urge consumers to stick to tap water, meaning locally accessed water, for their drinking and cooking needs rather than bottled water. Because our household water comes from 60 meters below our property, it’s mineral water. As a result, what comes out of our faucet has a distinct odor and we have to clean the grit out of our shower heads once in a while. Local authorities have tested our water and deem it to be safe to drink without a filter, but there’s no telling what that kind of water can do to your kidneys over time, so for drinking and cooking we fill tanks with filtered water offered by any of three supermarkets in our vicinity. Though it’s free, because of the time and labor involved, we don’t waste a drop of it. We keep commercially bottled water for emergencies, but we survive just fine without the public water system. When water availability is a function of capitalist prerogative rather than basic human need, you get by the best way you can.